Today we’ll look at the word brûkt, which shows up in some common phrases in modern West Frisian. Brûkt is pronounced with a long “oo” sound like in “moon.” BROOkt. This phrase can be followed by different prepositions, including foar. Foar means “for” and is pronounced with a long “oh” as in “foe” and a full “ah” as in “father. FOH-AHr. In grut part fan it Nederlânske transportrjocht dat brûkt wurdt foar rederijen en skippen is regele yn Boek 8 fan it Boargerlik Wetboek. A large part of the Netherlands’ transport law that is used for ferries and ships is codified in Book 8 of the Civil Lawbook. Remember, in means “a or “an” and is said with a schwa. UHn. Grut means “big” or “important” and is said with something similar to an “oo” as in “moon,” perhaps with more pursed lips though. GROOt. I’m making an educated guess here on Nederlânske: an “ey” as in “neighbor,” a schwa, a long “a” as in “father,” and another schwa. NEY-duh-LAHn-skuh. Rjocht means “law” or “right” (as in both the direction and being right). In older texts such as P. Sipma’s book, you may see it spelled rjucht, but it is always pronounced with a -y- followed by a full “o” as in “road.” It also takes the harsh “ch” (which actually sounds a bit more like a -k than an English -ch) found in the German “Bach” or Hebrew “l’chaim.” RYOHkht. Another educated guess for rederij: an initial “ih” as in “rid,” a schwa, and a final “ey” as in “hay” or “ray.” RIHd-duh-rey. The plural ending -en takes a schwa; I’m sure of that much at least. Remember that en means “and” and is said with a schwa. UHn. We’ve looked at skip before. It is a cognate of “ship,” and it sounds like the English word “skip.” The plural takes a schwa on the second syllable: SKIHp-pun. Recall that is is the same in Frisian and English. More educated guesswork: regele would likely take a long “ey” as in “neighbor” followed by schwas in the other syllables. Yn means “in” and is said with a long “ee” as in “green.” EEn. 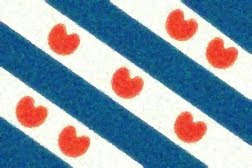 The Frisian word for "eight" is acht. Pronounce it with an "ah" as in father and the "kh" sound in "Bach" or "l'chaim." AHkht. Boargelik shows up in the phrase boargelik rjocht, meaning “civil law.” Boarger itself means a “citizen” or a “burgher.” Say it with a long “oh” as in “boat,” a full “ah” as in “father,” and with a schwa in the final two syllables. BOH-ahr-guh-luk.